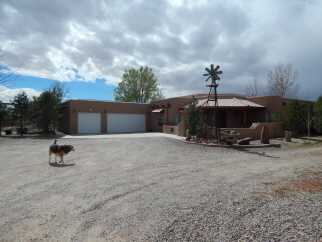 Description: Gorgeous southwest style in this custom home on a full acre! Private and secure location at the end of the access road. Enter through the gated courtyard to a fabulous tiled entryway and exposed adobe accent wall. Beautiful raised ceilings with vigas, lots of nichos, skylights. Fabulous gourmet kitchen has lots of cabinetry, breakfast bar and large pantry. Split bedroom design with walk-in closets. Access to the back patio from master suite with huge walk-in closet, and bath with jetted tub and separate walk-in shower. Master suite, 1 bedroom and the great room have access to back courtyard patio. Irrigation from ditch on south line. Property is completely fenced. 3-car oversize finished garage. Bring your horses and come enjoy the beautiful views!